As of right now (August 2008), the cheapest upgradable Mac on Apple's website is $2,799. On Dell's website, you can get an upgradable system for just $269. Sure, the Apple system comes with better stuff and more accessories, but what if you don't need or want all that? What if you just want a box to work on? When I got my Power Mac G4 (Digital Audio) system in the summer of 2008, I got it for just $50. According to EveryMac.com, my system cost $2,199 when it came out. Ouch. Because of Macs costing so much, many Mac users try to hold on to their old equipment for as long as possible. One of the things that helps keep a Mac usable with current software are processor upgrades. If you're using a G3 or G4 Mac, you may be able to upgrade the processor to something several times faster than what it currently has. Other World Computing (OWC) has a decent selection of upgrade processors. OWC's Mercury Extreme and Giga Designs are some of the upgrade processors people use. According to a user on the Applefritter, the Mercury Extreme and Giga Design 7455 CPU cards use the exact same controls for VCore adjustments. Messing with the VCore controls will void your warranty and possibly damage the CPU. 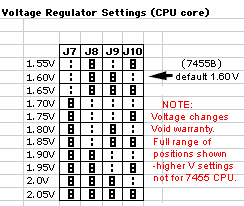 Some have altered their VCore (such as bumping it from 1.60v or 1.65v to 1.70v or 1.75v) in order to achieve a speed higher than what the CPU was rated at. The cooling on the OWC Mercury Extreme leaves a bit to be desired. The heatsink on it just happens to be 80mm wide, perfect size for an efficient 80mm fan! 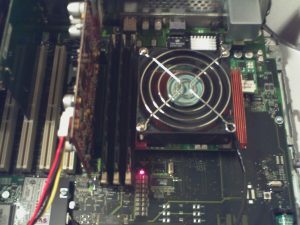 You will need to find some long screws that fit between the "fins" on the heatsink, and are long enough to reach the heatsink through the fan itself. Compared to the original cooling, two 40mm fans, the 80mm fan is just as quiet but moves a LOT more air. * The 7447 is usually the cheapest upgrade. It is low power, but has the least amount of cache compared to the other upgrade CPUs. * The 7455 is a popular choice. It draws the most power, but has a large L3 cache. Clock for clock, this one is usually faster than the 7447. * The 7448 is the newest design. It has a good amount of cache and uses less power than the 7455. It is more expensive than the others.